Former head of IDF Manpower: Instead of force, use hareidi money to reward soldiers. He rejects civilian service option. MK Elazar Stern (Hatnua), the former head of the IDF Human Resources Directorate, revealed his stance on hareidi-religious army enlistment in an interview Wednesday morning on IDF Radio (Galei Tzahal). 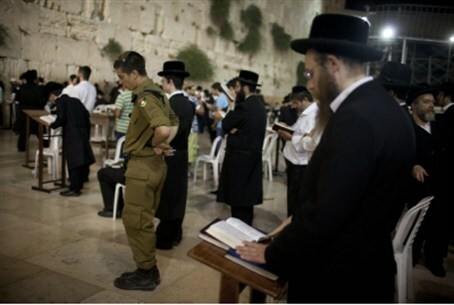 According to Stern, who was against the hesder army-Torah learning program as well, the government should not punish hareidi-religious yeshiva students who refuse to serve in the military. Instead, the government should allow them to work, he said, and then heavily tax their earnings. The funds gathered should be immediately used to reward soldiers, he proposed, thus boosting IDF enlistment and hareidi employment at the same time. “Let them give, take the money, and tomorrow morning give it to the soldiers in active service,” he said. “I think there should be a little force as well, but only a little,” he said. Many politicians and other leaders have raised the possibility of encouraging hareidi men to enlist in civilian national service (Sherut Leumi) if they reject the military service option. Stern dismissed that idea. “There’s no need for that many people in civilian national service. Setting up a civilian service network of tens of thousands of people would be like setting up another army,” he explained. While Stern opposed criminal penalties for yeshiva students who refuse to serve, he said that yeshiva principals who give false reports regarding their students to the military should face charges. “Even rabbis. I think it’s a desecration of G-d’s name, and there should certainly be criminal charges,” he stated. “The question is what about the thousands who won’t come [to the recruitment center] at all – we can’t put thousands of people in jail,” he continued. “Let them not come. But then I won’t fund their yeshivas. Each year we reduce the benefits [for hareidi yeshivas] until we reach a point of 40% less funding. That money should be given to soldiers who completed their service,” he suggested. Stern also shared his views regarding the recent Hesder yeshiva controversy. Hesder students do a five-year army program during which they spend 16 months in active service and over three years studying Torah; some have argued that they should spend more time in active service.